In 2000, the day after he left university, Moustafa Hamwi left Syria to go to Dubai. He was working at an advertising firm, Leo Burnett. One year, after his own birthday party guest list hit 650 attendees, he launched an immensely successful events business. In just five years, he had 45 employees, made $15 Million and then subsequently lost most of it after having to shut down in the recession and losing most of it to bad debt and investments. In 2012, he bought a one-way ticket to India – to Rishikesh, which is in the northern state of Uttarakhand. It is the spiritual home of yoga and meditation and is where the Beatles went to an ashram in the 1960’s. While there, he met a swami in a cave who asked him the question, “What are you thirsty for? Only when you know will you quench you thirst”. With that in mind, he went back to Dubai, set up a series of talks and courses to help people find their passion. Now globally known as “The Passion Guy”, Moustafa has had amazing success in launching platforms that are empowering people to work & live passionately, including a series of Passion Talks; and Passion Sundays, the leading online passion & happiness talk show. Moustafa was featured with Dr. Marshall Goldsmith, World’s #1 Leadership Thinker, on the blog of Thinkers50 which is the world’s most prestigious ranking of the top 50 management thinkers alive. He has interviewed over 50 global leaders, sports champions, award winning artists and celebrities, diving deep into their interpretation of passion and its impact on all aspects of success in business and life, including: leadership, innovation, employee engagement, performance and quality of life. He has run workshops for local companies from Emaar Hospitality and Mubadala to multinationals like General Electric, HP and HSBC. 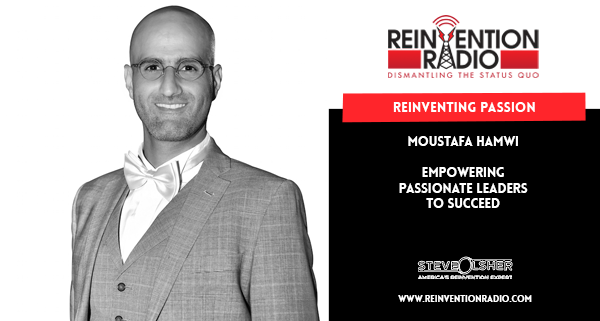 TUNE IN to this episode as Moustafa chats with Steve, Mary and Richard about how he helps empower passionate leaders to succeed. Reinventing Family Tradition – In this episode, don Miguel Ruiz, Jr. chats with Steve, Mary and Richard about how combining his family traditions with the wealth of knowledge he gained from his own personal journey helps him to show others how to achieve their own personal freedom and optimal physical and spiritual health.